During the Mom Blog Tour this past January at the Winter Fancy Food Show, I had the opportunity to spend a little time talking to Real California Milk. You may have seen their logo on many of your family’s favorite dairy products, but do you know what that seal means? When you see this logo from Real California Milk, it means you are buying the simple and real dairy foods made with milk from more than 1,300 California dairy families! It also means that it has been certified as having been made with 100% Real California Milk from Real California families! Did you know that California is the country’s leading producer of milk, ice cream, butter, nonfat dry milk and whey protein concentrate? It’s also the second largest producer or cheese and yogurt. Last week, we had some really lovely spring weather and it really got me in the mood for one of my favorite desserts: Cheesecake with Blueberries. I thought it would be a great to lighten up my cheesecake recipe by using yogurt from Real California Dairy farms. You would be surprised at difference in taste and texture that the yogurt adds to a cheesecake. Making your own graham cracker crust is so easy too! You’d be shocked to know that even the novice baker can do it! 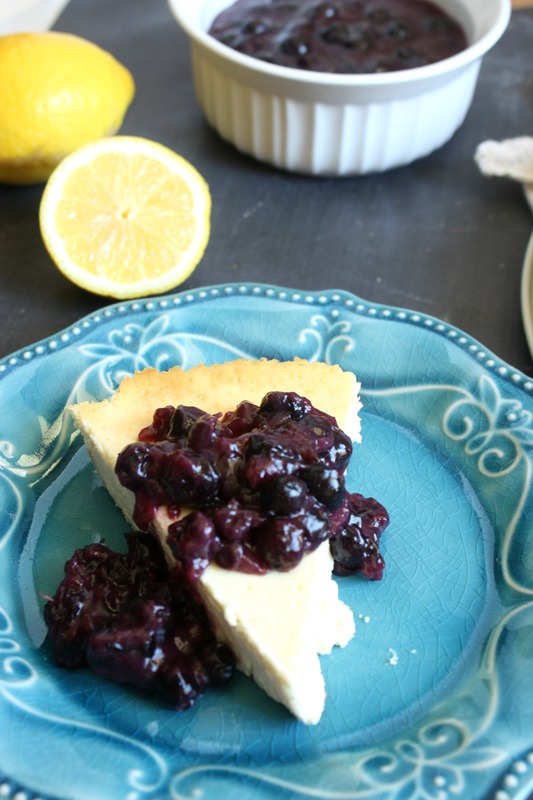 Delicious Cheesecake recipe made with yogurt and cream cheese, topped with a lemon blueberry compote. 16 oz of cream cheese at room temp. In a food processor, pulse graham crackers to a fine flour. In a large bowl, add graham cracker crumbs, butter, sugar and salt. Add the mixture to a springform pan. Press the crust into the bottom of the pan and up the sides. 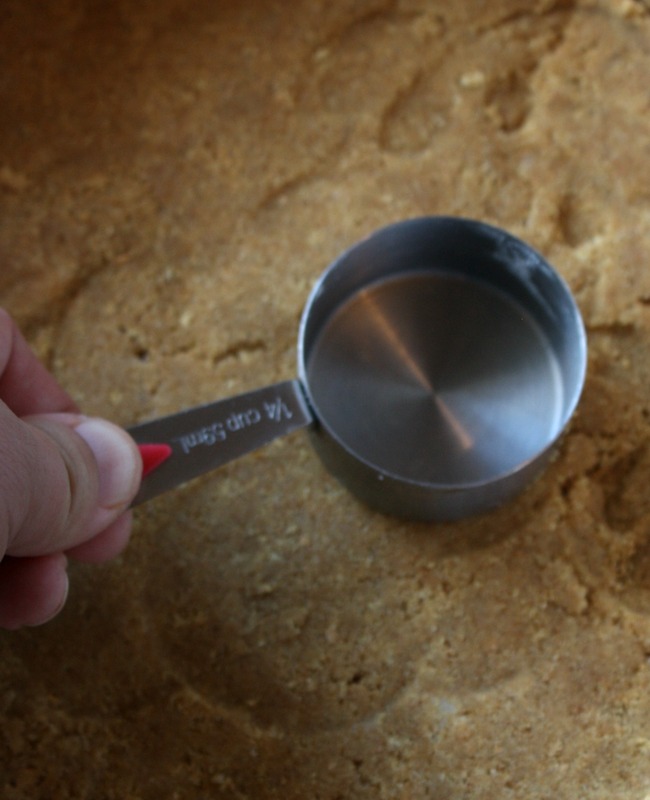 Use the bottom of a measuring cup to pack the crust down. Put the crust into the freezer. In the food processor, combine yogurt, cream cheese, eggs, flour, sugar, vanilla and zest. Combine until the mixture is creamy and mixed together. Take the crust out of the freezer and pour your batter into the crust, smoothing any bubbles and making sure it is even. Bake 45 minutes or until the cheesecake is set and slightly golden on top. Shut off the oven and let the cheesecake sit in the oven for an additional 20-25 minutes as the oven cools down, this will help the top from cracking. Cool on a wire cooling rack and then refrigerate until the cheesecake is completely cooled. To make the blueberry sauce, mix together orange juice, sugar and flour in a medium saucepan. When the mixture thickens, add blueberries. Simmer on low for about 5 minutes, until most of the berries have burst. Serve over slices of the cheesecake. We ended up having way more blueberry compote than we thought, so it was perfect to add into the plain yogurt for a healthy snack. One lucky reader is going to win a prize package of assorted dairy products made in California from Real California Milk. To enter, follow the steps in the giveaway tool below. This giveaway will end on 3/22 at 11:59p ET. One winner per household, email address, or home address. If you have won this prize on another blog you are ineligible to win again. Winner must have a U.S.-based address to receive the prize. Wow, this cheesecake you made using yogurt looks super delicious! I’ve always been a big fan of New York style cheesecake but this one looks awesome 🙂 Saving the recipe & will try it! I love cheesecake. This looks like a great recipe and I am going to try it. This sounds wonderful. I love blueberries on cheesecake. Sounds delicious, I’d also love to try it with strawberries. I’m a huge fan of cheesecake, Lord knows, lol. This recipe looks really tasty, especially with those blueberries! Gee, my favorite product? I’d have to say ice cream. Love real ice cream. Also, yogurt. YUM, YUM, YUMMY looking! I can not wait to try and make this! Real CA Cheese will make this even yummier. You had me at cheesecake. It just so happens that blueberry cheesecake is my favorite kind. YUM! My favorite Real California Milk product is cheese. Your recipe for Yogurt Cheesecake with Blueberries sounds delicious. I love plain milk or chocolate milk. Always refreshing. Sounds really yummy and easy to make. Love the combination of the blueberries and cheesecake. I love all the cheeses. I use Romano most. I think I’ll try the cheesecake for dessert this week. It looks delicious! I love blueberries and cheesecake! This looks delicious! I love Real California Milk sour cream. It is so creamy and rich. The idea to mix yogurt and cream cheese together is really great, and I’m sure the taste must be delicious. The blueberry compote sounds perfect to add to this cake. YUM, this looks delicious. I do love my dessert and a cheesecake with blueberries would be perfect. I must try this soon. Oh, my gosh. How early is too early to start thinking about making cheesecake? Blueberry cheesecake has got to be one of my favorite desserts of all time. Will definitely be trying this recipe this week! oh yummy! Nothing would make me turn down a good cheesecake and those blueberries look delish. I love always all kinds of cheesecake so this is perfect. This recipe looks so delicious. I love cheesecake, and your way of making it sounds incredible. Ooh! This looks yummy! I’ve made my own graham cracker crust before and I’d love to attemp this recipe! I bet the yogurt adds an awesome texture! I love cheese, I add it to about every meal I have. I love Cheesecake but never tried it using yogurt, I might have to give it a try and you can not go wrong with blueberries. I’ve been craving cheesecake lately. This looks absolutely delicious! This looks and sounds delicious. I made a yogurt cheesecake before but it was a no bake one. This cheesecake looks so yummy. I never would have thought to put yogurt in it. Thanks for the recipe. This looks good. I was in Denver a couple weeks ago and saw those logos and was wondering where they came from. I was almost about to google and something else came up so I never got around doing it. Now I know. My youngest is OB-Sessed with blueberries and my husband loves cheesecake. This seems like the perfect combination of the two and something that the whole family would enjoy. Oh my this sounds absolutely delicious! I will definitely have to try this recipe soon. Thank you for sharing. YUM! I love Cheesecake, especially when you add fruit to it. This recipe sounds so simple and oh so delicious. Cheesecake might just be my favorite dessert. But I’ve never had it with yogurt. Now I can’t wait to try it. It looks delicious!! This cheesecake looks amazing!! Ive never thought to use yogurt!! Can’t wait to try it!! My favorite milk product is the MONTEREY JACK CHEESE. My favorite desert is cheesecake, this recipe looks very easy to make and I know my whole family would enjoy it. Oh, Lord, I’m sugar free right now and this looks sooooo gooood. I am certain I could eat the whole thing for myself. I love a good cheesecake! I wish I was not dieting though because I would no joke make this tomorrow! I LOVE blueberry pie, but surprisingly haven’t tried it as a cheesecake topping yet. I bet it’s an amazing combination! Wow, that looks amazing! And I could rationalize eating an extra slice because the blueberries make it super healthy, right?! I think this is lovely. I have always liked cheesecakes. I would love to keep the recipe it looks so good, I’m craving for a slice right now. That looks so good! I love that you used yogurt to make it more healthy. Your cheesecake recipe looks so creamy and delicious. Baking with yogurt not only adds to the taste and texture but is a great way to cut calories, too. I love a delicious cheesecake but haven’t used yogurt in it before. This looks so good. I’ll have give it a try. My husband absolutely loves cheesecake, yet I have never tried to make from scratch. I will have to give this one a try! I know I’m not pregnant but I’ve been CRAVING cheesecake almost every single day! It’s insane! I will have to try this since going out each time for cheesecake is going to break my budget! haha, I’m sure I will love this! I Can’t wait! I have never had yogurt cheesecake, it sounds delicious! I love the addition of the blueberries! I love cheesecake and I’d love to try this yogurt variation. The blueberries are…the icing on the cake? The cherry on top? Well, they’re blueberries. It’s all good. Both my faves combined! Yummy! Great recipe I’m so bookmarking it! I love this melt in your melt goodness! This should be on my must try list! I absolutely love cheesecake but always go for the strawberries. This recipe seems easy enough and I’m thinking I’ll try blueberries. Had never considered that really but this looks yummy! I never say no to a good cheesecake! I never tried it with yogurt, I bet it was super rich and creamy! As a chef, I would try this out in the small restaurant I work in. Very lite and excellent finish to any entree. Oh wow this looks amazing! Cheesecake with fresh fruit and it’s made with yogurt I love that! I just love cheesecake and the best is when it has Oreos, thank you so much!! My favorite California Dairy product is ice cream. I scream for ice cream. Cheesecake is and easy go to party pleaser. I have never been disappointed in making a cheesecake. I love cheesecakes but I haven’t tried a yogurt cheesecake one. My kids love yogurt so I think this will be a perfect dessert to make during weekends. I love it all but especially California cheese. I’ve never made cheesecake with yogurt, but it looks like it works really well! I’m drooling over here! My boyfriend loves cheesecake! I’m going to share this recipe with him. Pinned! I love cheesecake and this looks delicious. The fruit topping is perfect! I am not much of a fan of sweets but for some things I make exceptions. Cheesecake is one of those exceptions. There is nothing like a well made cheesecake! I like how this is made with yogurt, I think it would be interesting, and adding a topping like blueberries would be great too. My favorite California Dairy product would have to be cheese. I use it in so many things and it is so versatile. I like almost any kind of cheese from feta to brie but out of them all I think a good cheddar cant be beat. I love that you used yogurt in this cheesecake! I bet it lead to a creamier consistency! And blueberries on top? Yes please! Wow, this looks wonderful. My daughters and husband love cheesecake but I never make it at home. I definitely should make this one! Beautiful dessert. 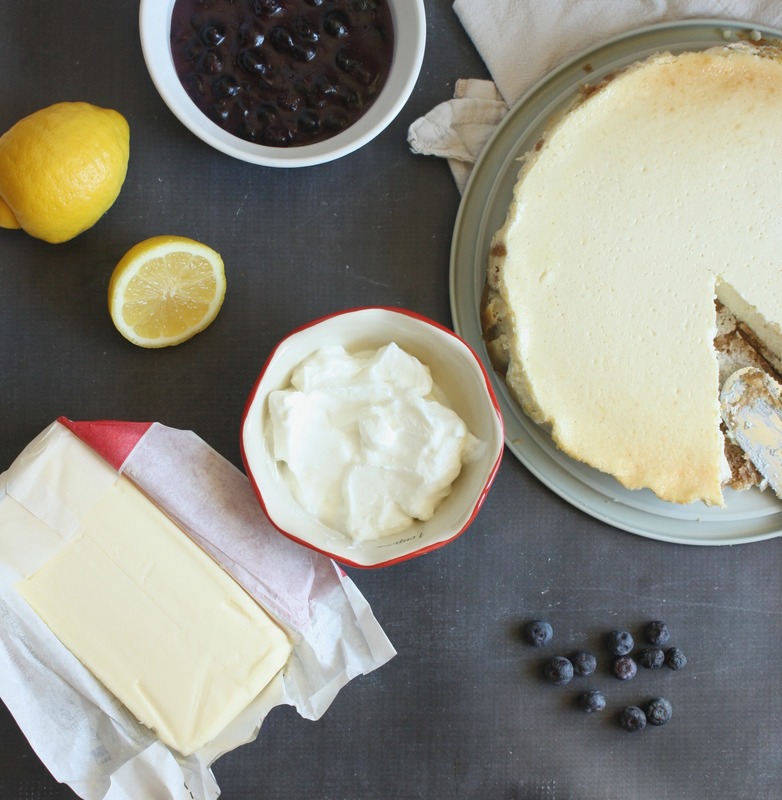 Blueberries belong on cheesecake. It is important to use the best ingredients in whatever dish we make. We cheesecake experts and from the appearance of yours – it rates a ten. I’ve always made my cheesecakes mostly with sour cream. So I’m so fascinated to try this version with yogurt-. I bet strawberries or mixed berries would be yum. LOVE the addition of yogurt to cheesecake. It’s a great way to add some good nutrition, and I bet it brings a really delicious tang in the flavor. You nailed it! What a great way to showcase California Milk products! Now that I’m AWARE of the seal, I see it everywhere! What an awesome giveaway. Cheese is my love language – love pretty much all varieties and types, especially when you put in a pan with blueberries. Yum. Cheesecake really is perfect for spring and I love the idea of making a compote to go along with it. Because most of the time I like my cheesecake plain so I love the option of just drizzling a little bit of the compote on top! I love ice cream. There are so many flavor options now. The picture of the cheesecake looks so, so good. Looks so delicious! I am sure cheesecake with yogurt must be a great option…I love cheesecake and mostly make it eggless, so it will be a great option to use yogurt in that..
Yum! I love that you’ve used yogurt. This would be delish for Easter or any gathering. Wow I love sweets and I love cheesecake but this Yogurt Cheesecake? Wow this sounds absolutely amazing! I will definitely try this out! Love the simple flavours in this cheesecake. The perfect way to end a meal. Yogurt is a great addition and I bet really adds to the creamy texture. Oh…. the addition of the yogurt sounds interesting and delicious! I will be printing this recipe so that I can try it out soon. I love cooking period and this looks and sounds delicious for sure. I love that it is made with Real California Milk Products. They are delicious. My favorite California Milk product is cheese. There are so many good ones that come from California! Those plates are the best Christmas present I received! Oh my goodness, this cheesecake looks HEAVENLY! Love that it’s made with yogurt. The blueberries on top just make it even better! I haven’t tried yogrut in cheese cake.Your cheese cake is calling my name. Blueberries make it double treat. I love cheesecake and that blueberry compote looks Heavenly! My mom loves cheesecake too and her birthday is coming up and I think it would be the perfect time to make this for her! WoW the cheesecake looks really good and light too. 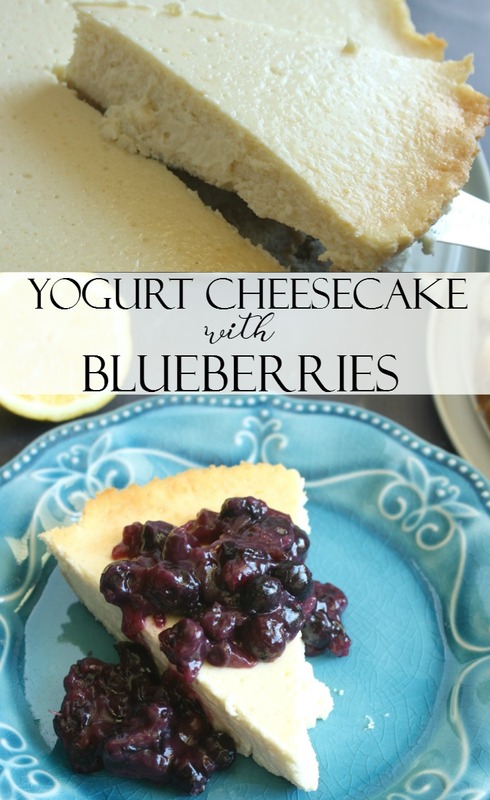 I love yogurt + cheesecakes, so this would definitely go into my must try recipe list. I love the cream cheese! You can make so many recipes with it. This sounds like a great recipe, I love cheesecake! I’ve never heard of using yogurt in it. I’ll have to give it a try. Cheesecakes are my weakness. And OMG… looking at this deliciousness now is making me want to start baking at 10PM hehe Looks perfect, creamy… and that blueberry jam on top is heaven. Cheesecake is always my choice of dessert when l feel like having something sweet. Your recipe looks lovely, the yogurt brings a nice silky texture, and the topping is just amazing. 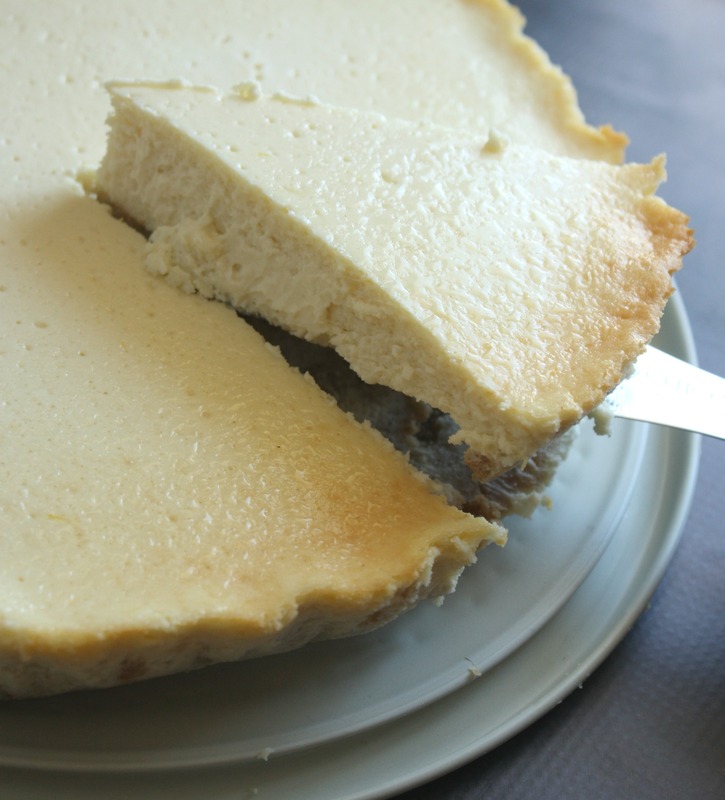 I love a great cheesecake recipe and this is no exception! I love hearing about my foods and where they come from so thank you for the dairy information about the seals. I will make sure and look for them when buying! MY favorite would have to be cheese! ….and sour cream….and yogurt…and cheese! Yogurt cheesecake sounds delish! What an amazing combo I would love to try this! My favorite, by far, is cheese! We love sour cream in so many recipes. This looks amazing. I need to make a grocery run so I can try this. I’m guessing that one of my favorite real California milk products would be milk. I also like yogurt and cottage cheese though too. And cheese. This cheesecake looks delicious. Thank you for sharing. My favorite Real California Milk product is their yogurt. I would say the cheese products. I would like to make this recipe. I love good old fashioned plain milk. I definitely want to give this recipe a try. My family loves cheesecake. This recipe sounds wonderful! OH cheesecake is the one dessert my daughter and I both enjoy. And with strawberries…. so delicious! My favorite milk product is chocolate milk. My favorite product is their cheese. This recipe looks so good. It is perfect for the summer months when you want something lighter. This looks so good and easy to make ! I am a sharp cheddar cheese whore. I will eat just about anything with cheese on it. Yum! I’m not a cheesecake fan, but I’d try it for the blueberries. I use to live in Chino, CA, where all the dairies use to be before they moved them up north. I give it to the farmers though. They are our there before God wakes up tending to the farm. God bless all farmerst.